Super Bowl XLIV: Colts Vs. Saints The Indianapolis Colts will face the New Orleans Saints in Super Bowl XLIV in Miami. 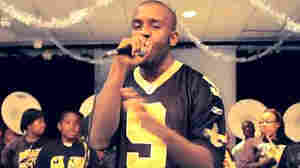 February 8, 2010  The New Orleans Saints are the champions of the National Football League. The Saints beat the favored Colts by two touchdowns, 31-17 in Miami, to win their first championship. Saints quarterback Dree Brees tied a Super Bowl record for completions and was voted the game's MVP. February 5, 2010  Last month, the Supreme Court handed corporations a new way to spend their funds — on ads advocating for or against political candidates. 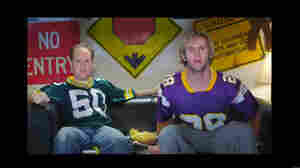 So what could corporations get if they put money into a campaign instead of buying a $2.5 million Super Bowl ad? Experts say that kind of money could cover enough ads to sway some House and Senate races. February 7, 2010  One thing football fans hear over and over again is that a team must run in order to be successful. You can't win in the NFL without a ground game, TV experts still say. But that doesn't seem to be the case in the Super Bowl, and it doesn't seem to be the case overall in the NFL. Running, as a means to victory, is under aerial assault from the passing game. February 4, 2010  When the Saints captured the NFC Championship two weeks ago, music roared from every neighborhood and spontaneous brass-band parades shut down streets: New Orleans rhythms exploded across the city in a way that seemed natural for celebrations of football glory. Now, you can hear 10 songs which typify the music in the New Orleans air right now. February 5, 2010  Having a tough time trying to figure out the football part of the Super Bowl? These Super Bowl conversation starters can help you wage a good offensive game on Sunday. February 4, 2010  During his nine years as the coach of the Baltimore Ravens, Brian Billick led the team to a Super Bowl win in 2001. Now a commentator for Fox Sports and the NFL Network, he joins Fresh Air to discuss the upcoming Super Bowl — and the future of the NFL. 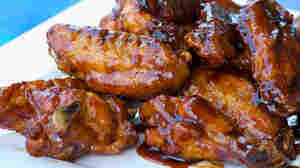 February 4, 2010  Football fans are looking forward to this Sunday's Super Bowl –- and a day full of good food. But the menu doesn't have to be limited to pizza and nachos. We asked two chefs from the Colts' and Saints' hometowns about what they'd be cooking this weekend. 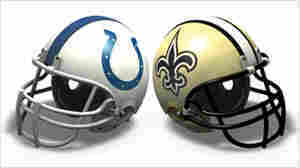 February 3, 2010  See how the New Orleans Saints and Indianapolis Colts match up in the NFL title game. AP writer Barry Wilner gives a preview of the game, along with a breakdown of key players and team statistics. February 3, 2010  There are just four days left until the Indianapolis Colts face the New Orleans Saints in Super Bowl XLIV in Miami. News leading up to the big game includes developments with some of the top players: Colts defensive end Dwight Freeney and quarterback Peyton Manning. February 3, 2010  Avid foodies and celebrity chefs, along with football's growing female audience, are influencing big-game grub. Let your guests think you're giving them the old standby snacks, then fake them out with a few gourmet twists. 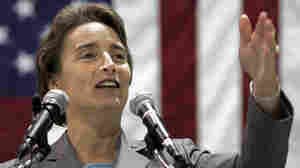 February 2, 2010  CBS said Monday that it has sold all of the ad time for Sunday's Super Bowl game. Typical advertisers are there, like Anheuser-Busch. Pepsi opted out and is mounting an online campaign instead. A senior manager at video game maker Electronic Arts told Bloomberg News it's worth spending millions for a 30-second spot because the game is one event where viewers actually watch the commercials. 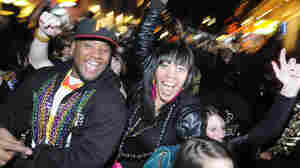 February 3, 2010  The party has started in New Orleans for the Saints' first-ever Super Bowl. Earlier this week, a bunch of men paraded around the French Quarter in ballgowns, including former quarterback Bobby Hebert. It was a memorial to Saints announcer Buddy Diliberto — who promised to walk Bourbon Street in a dress if the Saints got to the big game. Buddy D died five years ago. The Saints Or The NFL: Who Owns The Phrase 'Who Dat'? February 1, 2010  The New Orleans Saints are going for their first Super Bowl win ever when they play in the big game Sunday against the Indianapolis Colts. But a battle is brewing over the Saints' motto and rallying cry, "Who Dat?" January 25, 2010  Super Bowl Lineup Settled: The New Orleans Saints New Orleans Saints The face off for NFL Super Bowl XLIV is set. Sunday, 2007 Super Bowl championship team Indianapolis Colts came from behind to beat the New York Jets and earn another spot at the showdown. And the New Orleans Saints went into overtime to squeek past the Minnesota Vikings to secure their first Super Bowl slot. Sports Illustrated Reporter Pablo Torre offers analysis of the past football season gives his predictions.